Straddling two continents, Turkey has always been in a unique position—sometimes for the better, sometimes for the worse. Certainly, one of the better things is that its musicians have been influenced by sounds coming from both the East and West. Throughout the 1960s and '70s, many Turkish musicians invented their own hybrid form of rock with their traditional sounds and instruments, known as “Anatolian rock,” often with a heavy dose of psychedelic rock influence. 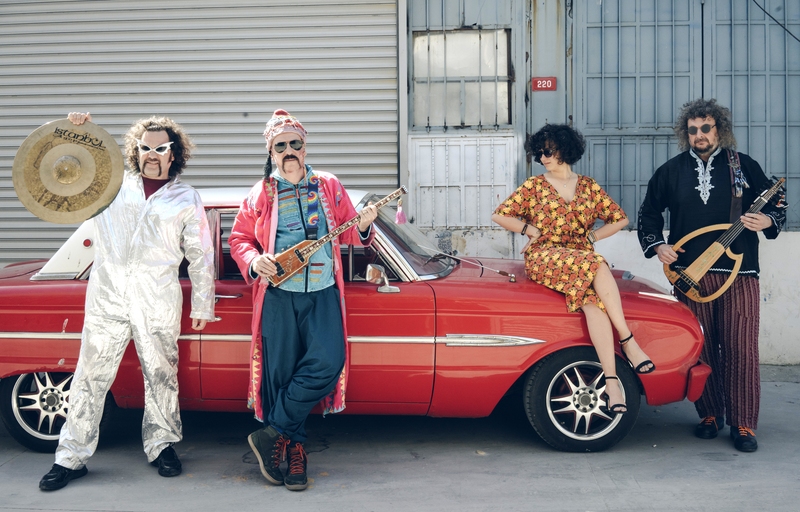 Turkish psychedelic rock waned towards the end of the millennium, but there has been a resurgence of interest in this subgenre. One of the most accomplished bands of this resurgence is Baba Zula. 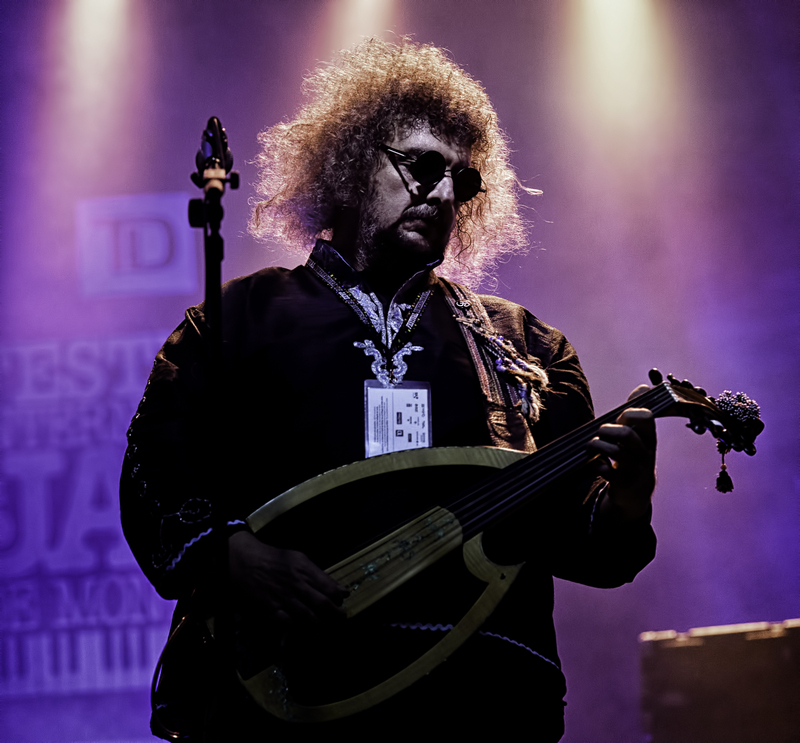 In the ensuing years, the band has had seen several changes in members, but always led by Ertel, on his electrified saz (a traditional seven-string Turkish instrument) and Akman on various percussion instruments. 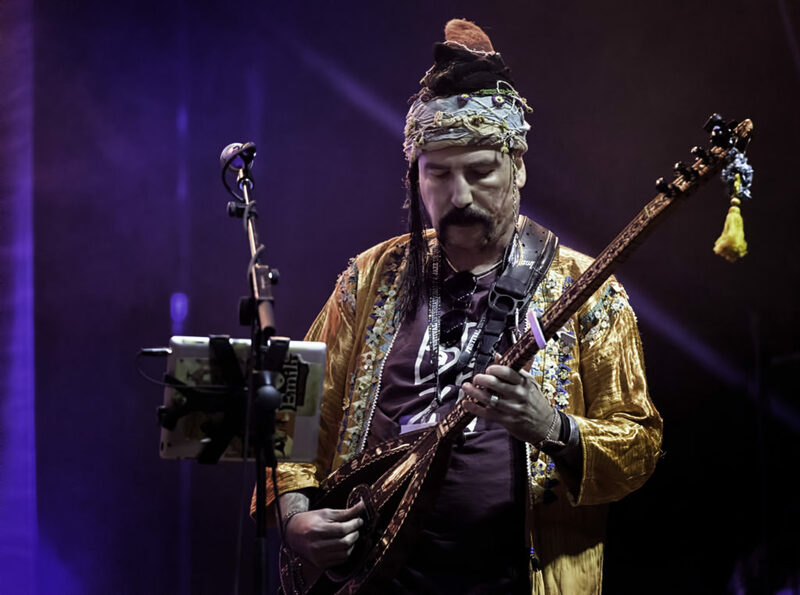 Baba Zula has released eight albums, working with producers and musicians such as Jamaican reggae duo Sly and Robbie, Guyanese dub legend Mad Professor, Canadian folk musician Brenna MacCrimmon and Norwegian jazz artist/producer Bugge Wesseltoft. 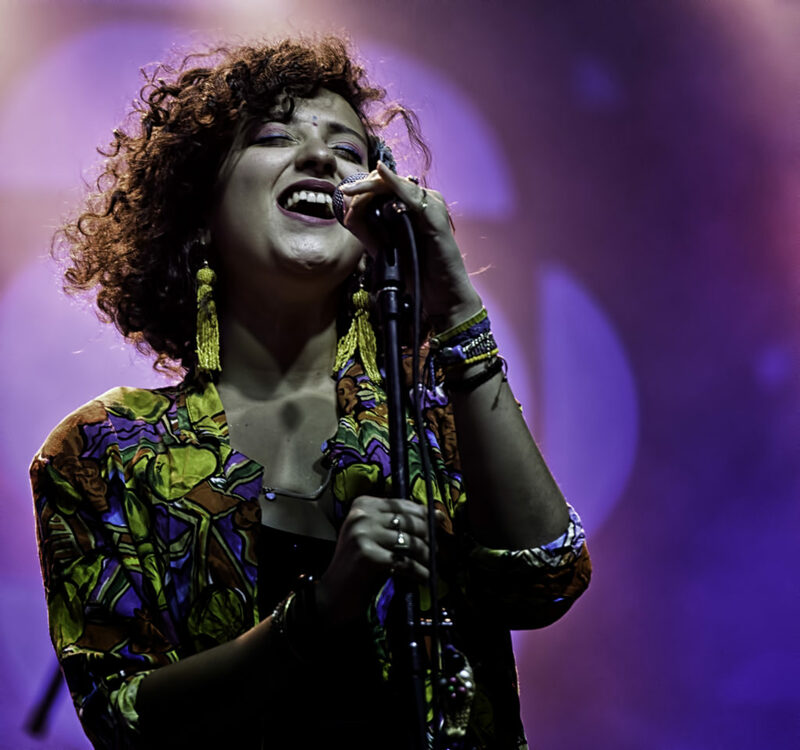 While their music is easy to dance to and trip out on, they've never been shy about putting their thoughts and opinions about both Turkish and global politics into their lyrics. Over the years, they've seen their music banned on both radio and television, and have had performances canceled due to their outspoken nature. 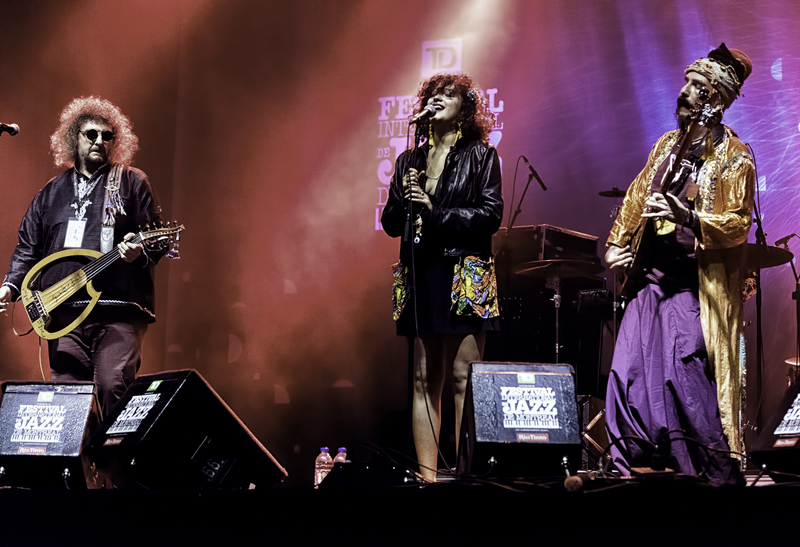 We had a chance to catch up with Ertel and Akman, along with current band members Periklis Tsoukalas, who plays electric oud, and singer Melike Şahin, before their concert at the Festival International de Jazz de Montreal in June. We should note the interview and concert took place just days after the June 28 attack at the airport in Istanbul, and a few weeks before the recent attempted military coup in July. Most of the group was able to fly out before the airport attack, but Akman was not able to rejoin the band until flights recommenced, though in time to make it for the show. All photos by David Kaufman. Ron Deutsch: I'm glad you all arrived safely here in Montreal, and I hope all your family and friends are safe. Levent Akman: Maybe we don't know the people, but now they are killed. Maybe they checked us in at the airport or carried our luggage. But they're gone now. Murat Ertel: If we didn't lose relatives this time, we lose them another time. For example, 23 years ago today, in Sivas, Turkey, there was a bombing of a hotel where 35 people died. The hotel was full of artists. Two of my relatives there, two young dancers—one was 17 years old and the other 18. I can't even imagine how difficult it must be for you back home these days. Melike Şahin: They've jailed our old teachers and professors. The situation is a bit depressing. Murat: We are getting more zula, you know? More secret, because unfortunately it's getting more dangerous. Periklis: Maybe this time it's not a first-degree relative, but it's some degree—because we're all humans. Innocent victims. And they are added to the power of freedom which is becoming more powerful. And that's why we are becoming more secret. The freedom now is more powerful and so now it's more dangerous, and some people can't handle it. 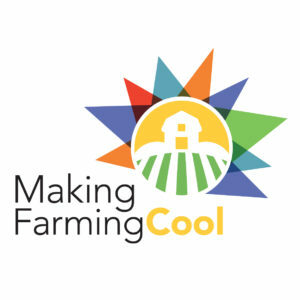 Your songs often take on subjects like globalization and politics. 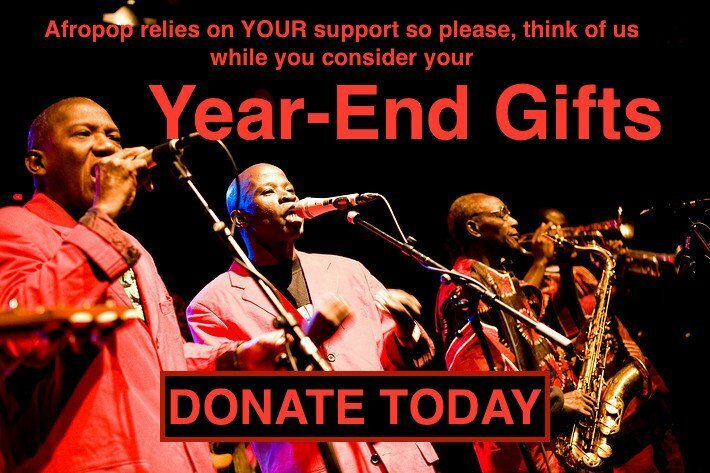 In terms of getting more zula, are you still able to perform back home? Levent: These days, we cannot, I think, perform in Turkey. But also, I think, we don't want to. We're performing less these days in Turkey, partly because of politics.... but it's a never-ending story. In Turkey, the people have big prejudices—because of religion, and other thoughts coming up from their roots. There are a lot of “not open-minded people” back home. But we have a following, yes. Periklis: You hear in our music some modern sounds coming from machines, but it's also combined with the very old traditions—the good parts of it—but also many other very important elements that have been filtered through what some might term “enemies.” For example, I am Greek. The others are Turkish. By the very nature of this band, when we go on stage—without even saying anything—people can see clearly what we are all about. Levent: We are playing in a lot of countries and places, and a lot of people also have prejudices like, “Oh, you come from Turkey, and the Turkish people are...,” you know, whatever. But then after two or three songs, they can see we are all human beings. We are living on the same planet. And we’re all having these same feelings, the same sadnesses. You see everyone dancing together, and I think it's very important. We then feel we're doing our job. We are giving some energy to them and they are giving some back—it's like a shamanic experience. We are trying to do this with every concert. Murat: We are all travelers and so being able to go many places is very important—to be able to survive in certain environments. So I think balance is really important with the issue of globalization. If you think we are living on one planet and we are not really capable of escaping from this planet very soon, then we need to think how we can survive with everybody—and that means also all the rocks and mountains, animals and plants together. If this balance is unbalanced, then it's going to be a big dystopia. Levent: What we see is that nations are changing. You can see now it's not that much about Turkey for us, because we are having more followers outside of Turkey. This is also happening in politics, the way people are thinking. There is really no “this nation” or “that nation,” but the kind of people you are. And we belong to the kind of people that we want something—dreaming of a life like this. It doesn't matter if they are coming from Turkey or what country. All of us belong to this other nation. This is my way thinking now. It's not any more about boundaries of countries. We are in a time for changing, because of all the bad things happenings—the bombings, the wars. Look at Syria, Afghanistan, Pakistan... all through the Middle East. Even in China. I hope these changes will be peaceful, and we are trying to do this through the music. But do you feel that you can communicate this message to people, like myself, who don't understand the Turkish lyrics of your songs? Murat: Most of what we're saying in our songs, I think are lost in translation. But even when we talk in a language that we both know lots of things are lost. There is no perfection there, but some of it comes through—both from gestures, some other things. I think, first and mostly, we are storytellers so that shows in our music. Even if we don't have lyrics, the songs without lyrics, there's always some story. Language is like a barrier from outer space, but at the same time music is a universal language. So some part of it passes through from what they are seeing and hearing. For instance, my father loved Bob Dylan but he didn't understand English. But he loved it. He also loved the traditional Ashik troubadour music. He really loved some people like Miriam Makeba, but she was singing in... I don't know how many languages. But it got through to me too, and I loved her, even though I didn't understand the language. But it is a problem of music with lyrics. Periklis: Lyrics are very powerful sometimes, but also the expression is more powerful, more important. Like Murat was saying, one of my favorite singers is from contemporary Japanese music, Kinshi Tsuruta, but I don't know a word of Japanese. But if you hear her singing, somehow you feel you understand. And then when you read the translation of the lyrics, you discover you are very, very close. Also [American avant-garde composer] Diamanda Galás—when she sings even one word like “fire”— how she says it, you burn inside. It's very important how you express yourself through the music. Levent: The music is important. Without the music, you can't understand the words. But words with music, you can somehow. Periklis: Music is not human, you know? We just transform it into human form using instruments. Music exists everywhere in nature, in space, in the world. We just try to imitate, to use and create something with musical instruments in order to communicate.